In a bold attempt to fill a gap in the popular literature on critical thinking, Almossawi uncovers 19 errors of reasoning in a series of appealingly-presented vignettes. Each is accompanied by a few short paragraphs of textual description together with a full-page woodcut-style illustration to exemplify how poor reasoning can lead us astray. Well-produced and charmingly illustrated, Bad Arguments presents itself as an accessible entrée into critical thinking for the uninitiated: a gift book or whimsical collectible for a thoughtful readership. Even before the publication of the hardcover edition by JasperCollins, Bad Arguments was widely circulated online with Creative Commons licensing, and its popularity is a testament to how unusual and exciting it is to see material on critical thinking presented in a genuinely creative way. The booksets out to introduce readers to an assortment of logical fallacies. One is a formalfallacy, in which the reasoning fails because it breaches the formal syntax of deductive logic. The rest are all informalones, in which the reasoning fails because rational persuasiveness gives way to various kinds of misleading rhetoric and muddled inferences. Some of the fallacies will be widely recognized -- the red herring, the straw man, the slippery slope and the emotional appeal, for instance -- while others are less familiar. Pervading the book is a sincere attempt to draw out the practical relevance of informal logic to our everyday lives ­-- and in a pioneering move, Almossawi has chosen a format that is far removed from the conventionally dry philosophical monograph. Almossawi is to be commended for his efforts to present challenging abstractions in a novel and palatable way. Where Bad Arguments aims high, however, it misses the mark in several respects. Although it does eventually succeed in bringing about "a realization of the dangers of flimsy arguments and how commonplace they are in our everyday lives," Bad Arguments merely skirts around its other aim of illuminating "the complexities of inductive arguments where probabilities come into play" and -- despite the author's hopes -- barely addresses "the benefits of watertight arguments in validating and expanding knowledge." Without a doubt, improving reasoning skills in the general public is a worthy cause. It engenders broader and more intelligent participation in public debates, more subtle articulation of arguments and more sensitive consideration of alternative views, all leading (one would hope) to more sophisticated and civic-minded policy positions. 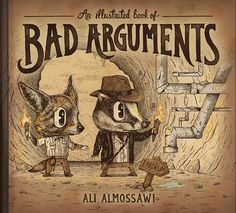 Clearly concerned with such issues, Almossawi seeks to improve his readers' skills in critical thinking and cogent reasoning by drawing attention to the various characteristics of good arguments: precision and rigor, as already mentioned, but also clarity, consistency, coherence, relevance and completeness. While the narrative of Bad Arguments touches glancingly on these characteristics, they are unfortunately not embodied in the writing itself. Many passages lack clarity to the point of requiring repeated reading, the syntax is often clunky and nuance is routinely compromised in favour of brevity. While possibilities for elaboration are obviously constrained by the chosen format, the writing is highly elliptical and this creates ambiguities that have no place in any factual writing, much less in a book about clear thinking and logical argument. Many of the arguments are not appropriately fleshed out and several of the examples provided appear to be disconnected or tangential. Most disappointingly, the writing generally fails to consider the reader: obscure names are used without introduction; technical terms are employed without sufficient explanation and are not subsequently reinforced;ideas don't follow one another in a logical sequence. These infelicities make the text itself inaccessible. Further editorial attention would pay dividends --and given Almossawi's admirable vision, a revised edition would be most welcome. For me, one of the book's chief points of interest is its typology of fallacies. Each double-page spread in Bad Arguments categorizes the fallacy under consideration according to its subtype, e.g. Informal Fallacy > Ambiguity > Equivocation > Redefinition > No True Scotsman. By comparing such hierarchies, readers can determine how the different fallacies in the book are conceptually related. It would have been easier to understand these relationships if the book had included a tree diagram incorporating all of the fallacies under investigation. Even without such a diagram, the relationship between the fallacies could have been made clearer by structuring the book in a more systematic way. As it stands, the fallacies appear to be ordered randomly, perhaps on the assumption that readers will tend to dip into the book rather than reading from cover to cover. The often idiosyncratic examples in Bad Arguments -- and the fallacies themselves -- are thought-provoking teasers that whet my appetite for a deeper understanding of where arguments go wrong. Any book that stimulates curiosity in this way is to be celebrated, whatever its shortcomings. I hope to see many more books on critical thinking designed in such an innovative and attractive way. Michelle Sowey runs philosophy programs for children in Australia through her social enterprise, The Philosophy Club. You can follow her thoughts on The Philosophy Club blog and on Facebook.